Barcelona have made a renewed offer of £35m for Cesc Fábregas and they hope that it will prove decisive in the battle to prise him from Arsenal. The European and Spanish champions scent victory in the long-running saga of the Spain midfielder and Arsenal have been left to consider their next move. 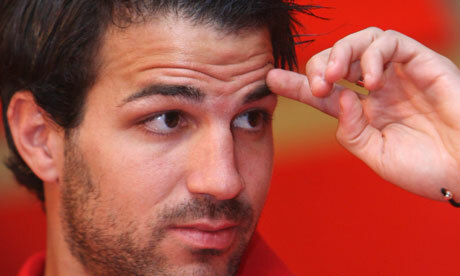 Fabregas has said he is calm and optimistic over his possible transfer. Speaking at a football campus in Tordera, Spain, the 24-year-old was quoted as saying in AS: “I’m calm and I am optimistic. I have nothing to say and there is nothing to speak of. Discussion are ongoing at the Emirates Stadium as they digest the mathematics of Barcelona’s second bid of the summer – they have already had £27m rejected – and also the PR implications. The sense, however, despite Arsenal wanting closer to £40m, is that the matter is finally approaching a conclusion and Fábregas will get his move back to the club where he started out as a trainee. He wanted the transfer to happen last summer, when Barcelona made two offers for him – the second of €40m (roughly £36m) – only for Arsène Wenger, the Arsenal manager, to block the deal. Fábregas’s desire to rejoin Barcelona has not changed yet the climate has, in that Arsenal’s resolve to hold him to the terms of his contract, which expires in 2015, has softened. Barcelona have not conducted their pursuit quite so publicly via the Spanish media this time. Perhaps Sandro Rosell, the chairman, was stung by the experiences of last summer when he not only failed to land Fábregas but stood accused of attempting to destabilise Arsenal. The London club emerged with their captain and the moral high ground. Rosell, though, has a good relationship with the Arsenal chief executive Ivan Gazidis – the pair sometimes lunch together – and he has continued to plug away over Fábregas, albeit more discreetly, which is always how Arsenal prefer to do business. There remains an open channel of communication between the clubs. Fábregas is in Barcelona on holiday and he would prefer not to have to return for pre-season training at Arsenal next Tuesday. Wenger and his players depart for a mini-tour of Malaysia and China on Sunday week. The transfer window in Spain opens on Friday.